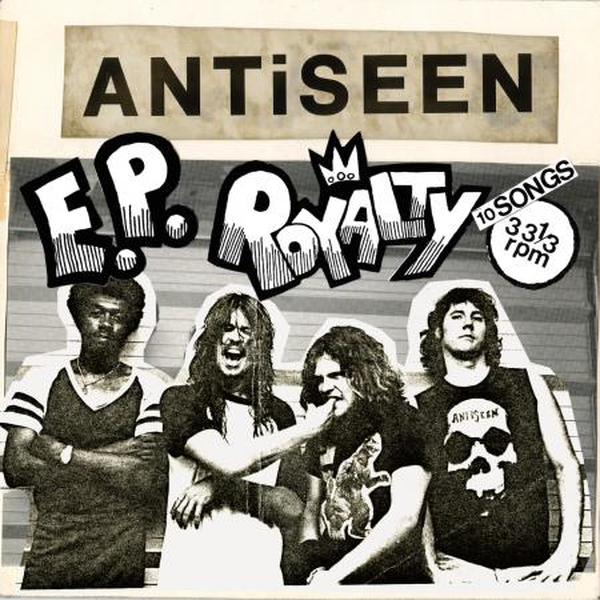 Volume 10 of the Vault of ANTiSEEN Reissue Series revisits ANTiSEEN's second EP from 1986. We feel this classic record warrants a classic review to provide context. Here's what CREEM magazine had to say at the time of it's original release: "Down the coast a piece we find the redneck-crunge big-beat slime-barrage white-trash spuz of Antiseen, a quartet of longhaired country-boys who mate MC5 tire-kick and Black Oak Arkansas can-kick, and toss a bit of "Gimme Three Steps" and "Great Balls Of Fire" and "Billion Dollar Babies" and "Freddie's Dead" and "Oakie From Muskogee" in there too, on EP Royalty. These kickers call their brew 'destructo-rock,' and it's as catchy as it is violent..."